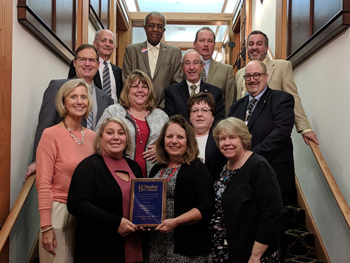 Beebe Healthcare recognized employees and physicians for their dedication and commitment to high quality patient care during the eighth annual Quality and Safety Awards Banquet held November 6 at Kings Creek Country Club in Rehoboth Beach. The evening represented the culmination of a year’s work by nine teams, made up of 140 Beebe team members. The teams designed and implemented process improvement initiatives to positively impact patient care at Beebe. Three of the nine teams were presented with awards for their outstanding projects, which solved quality or safety problems identified in a healthcare setting. Stephen Fanto, MD, Chairman of the Board of Director’s Quality and Safety Committee, introduced the three teams, who then formally presented their project goals, methodologies, and solutions. Obstetrical Hemorrhage – The Use of the 4 R’s: Presented by Bridget Buckaloo, MSN, Executive Director of Women’s and Children’s Health Services. After observing longer lengths of stay and higher readmission and surgical site infection rates than they preferred to see among elective colorectal surgery patients, along with variation in practices among surgeons, the Quality team knew a change needed to be made. A team was assembled to implement the Enhanced Recovery After Surgery (ERAS) Program for Elective Colorectal Surgery Patients. This team reviewed evidence-based practices and conducted an analysis to identify gaps between current and evidence based practices. They then shared this information with the surgeons who perform elective colorectal surgeries and developed and implemented an education program for staff, surgeons, anesthesiologists, and outpatient offices. In addition, the team developed a new pre-operative booklet, which contains updated surgery preparation information. They also developed a multimodal, opioid-sparing pain management protocol and instituted early mobilization for post-operative patients. Through the ERAS program, the team reduced the average length of stay by 40% and the 30-day readmission rate by 48%. They also significantly reduced post-operative opioid usage and surgical site infections. Learn more about Beebe Surgical Services. Patients in need of radiologic testing, such as X-rays or CT scans, were encountering longer than necessary wait times and were at risk of harm due to radiology order entry errors, which were magnified by an inefficient registration process. After receiving several questions, Mr. Mapes and Mr. Winkfield, began researching the issue and collecting data. They then developed a standardized training program and order guides for the registration team and implemented an annual retraining program. They also educated radiation technologists and moved patient history and screening forms away from the registration desk, allowing registrars to focus on registration. By standardizing the order entry process, the team was able to reduce the error rate from 5.1% to 1.5%. Learn more about Beebe Diagnostics & Outpatient Services. In the United States, obstetrical hemorrhage affects 2-5% all births and is one of the leading causes of maternal death. The rate of postpartum hemorrhage increased 26% between 1994 and 2006, primarily because of increased rates of uterine atony, which is when the uterus fails to contract after birth. This is often due to a long labor or the prolonged use of epidurals and/or Pitocin, which cause the uterine muscle to tire out before it is finished contracting. Additional contributing factors include failure to recognize excessive blood loss during the birth process and a lack of early interventions. The use of the four R’s: Readiness, Recognition, Response, and Reporting, as part of a Patient Safety Bundle, is a way to standardize processes to improve quality of care and patient outcomes. At Beebe, implementing the four R’s included staff and provider training (including live simulation), the deployment of a hemorrhage cart, the development of specific protocols, and the creation of a dashboard to track obstetrical hemorrhage and transfusion rates. To sustain improvements over the long term, providers and staff will hold ongoing drills, live simulations with debriefings, and continue to monitor outcome data. The team has also applied for a grant for medical grade scales to quantify blood loss. Learn more about Beebe Women's Health. 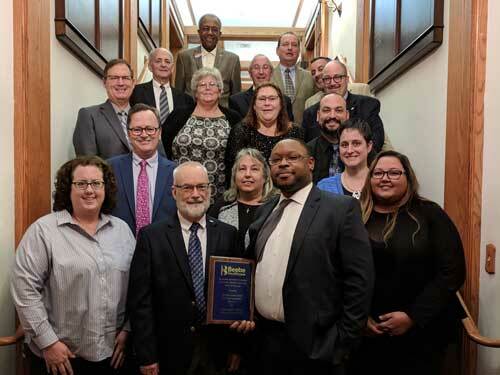 Quality Awards 2018_ERAS: The Enhanced Recovery After Surgery Team at Beebe Healthcare won a 2018 Quality and Safety Award. First row (shown left to right): Mary Lou Warren, RN; Tracy Williams, RN; Teresa Hitchens, MSN, BSN, RN, CNOR, CRNFA(E), CPHQ; Robin Feroli. Second row: Rhonda Beaudet, RN; David Herbert, Chairman of the Board of Directors; Rick Schaffner, RN, Executive Vice President and Chief Operating Officer; Beth Richardson, MSN, MPH, RN. Back: Wesley Perkins, Board of Directors; Stephen Fanto, MD; Paul Peet, MD; Jeffrey M. Fried, FACHE, President and Chief Executive Officer; Steven Rhone, BSN, MS, NE-BC, Vice President, Patient Care Services. 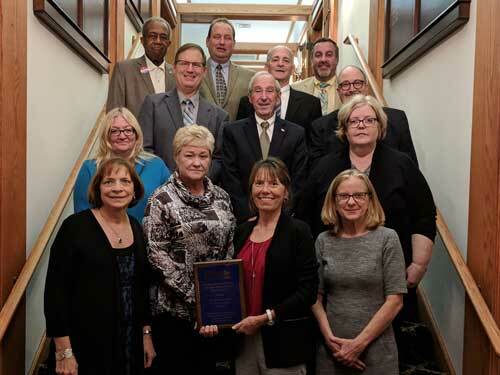 Quality Awards 2018_Radiology: The team that led improvements to the radiology order entry process at Beebe Healthcare won 2018 Quality and Safety Award. First row (shown left to right): Michele Mankins, RT(R)(CV); Robert Urbanski; Dan Mapes; Norma Shelton, ABS, CHAA; Maurice Winkfield; Nida Garunkstis; Jessica Rapolla. Second row: Stephen Fanto, MD; Tracy O’Hara; Andrea Newberry, CHAM; Matthew Kall. Back: Jeffrey M. Fried, FACHE, President and Chief Executive Officer; Wesley Perkins, Board of Directors; David Herbert, Chairman of the Board of Directors; Paul Peet, MD; Steven Rhone, BSN, MS, NE-BC, Vice President, Patient Care Services; Rick Schaffner, RN, Executive Vice President and Chief Operating Officer. Quality Awards 2018_OB Hemorrhage: The Obstetrical Hemorrhage Team at Beebe Healthcare won a 2018 Quality and Safety Award. First row (shown left to right): Theresa Crowson, RN; Linda Schultz; Elisabeth Klein, DNP, RNC-OB, RNC-LRN. Second row: Bridget Buckaloo, MSN, Executive Director of Women’s and Children’s Health Services; Laurie Lucinski; Kathy Podbesek, MSN, RN-BC; Rick Schaffner, RN, Executive Vice President and Chief Operating Officer. Back: Stephen Fanto, MD; Jeffrey M. Fried, FACHE, President and Chief Executive Officer; Wesley Perkins, Board of Directors; David Herbert, Chairman of the Board of Directors; Paul Peet, MD; Steven Rhone, BSN, MS, NE-BC, Vice President, Patient Care Services.